Every believer is a precious part of Christ's body. When even one is missing, the church lacks power and is less than whole. Whether we're victims, perpetrators, or innocent bystanders, we're called by God to seek restoration. And when one of God's sheep goes missing we have no choice. We must Bring 'Em Back Alive. It was a story Jesus liked to tell. If a man owned a hundred sheep and one of them wandered away, he would, without hesitation, leave the ninety-nine and search for the one. And when he found that lost sheep he would celebrate with great joy. In the same way, Jesus concluded, our Father in heaven–like the shepherd–is unwilling for any of his sheep to be lost. Yet all too often God’s sheep do wander from the flock. Sometimes, for reasons that are hard to discern, they stray on their own. Other times they’re driven away, perhaps wounded by an unkind word or thoughtless deed. In Bring ’Em Back Alive author Dave Burchett shows us the importance of bringing these lost and wounded lambs back to the fold–or, when we’re the ones who wandered, becoming willing to return. He explains, step-by-step, how to replenish the spiritual strength of Christ’s body. And he reminds us that we, like the shepherd, can know the joy that comes when a lost sheep returns home. Every believer is a precious part of Christ’s body. When even one is missing, the church lacks power and is less than whole. Whether we’re victims, perpetrators, or innocent bystanders we’re called by God to seek restoration. And when one of God’s sheep goes missing we have no choice: We must Bring ’Em Back Alive. Includes questions at the end of each chapter for discussion and reflection. 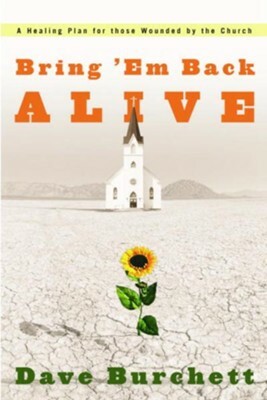 I'm the author/artist and I want to review Bring 'Em Back Alive: A Healing Plan for those Wounded by the Church - eBook.